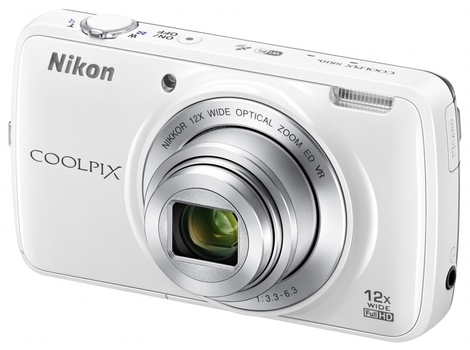 The Nikon CoolPix S810c is an innovative compact digicam. As one of only a few cameras to incorporate the Android operating system, the camera offers an entirely new set of abilities. While the S810c offers appealing photography features and good image quality, poor battery life and slow performance drag it down. This is a good start to a new generation and we look forward to seeing how this line develops. Read more in our Full Conclusion. We've written before about how smartphones have caused a 40% drop in digital camera sales, effecting mostly point-and-shoot and ILC models. Most of this is simply convenience -- why would anyone want to have to carry around two hand-held devices when one can do everything almost as well as both combined? Well, Nikon has a new camera that aims to combine the optics of a high-quality fixed lens camera with the form and functionality of a smartphone. Meet the Nikon Coolpix S810c, which runs off the Android Operating System (4.2.2 Jelly Bean). While the S810c can't make phone calls (though someone will probably hack a way to do it over Wi-Fi), it does boast a nice 12x optical zoom lens. With this operating system, you get access to tons of Google Apps like email, maps, a web browser, and Google Play, which gives you more apps like Facebook, Twitter, and Instagram. GPS is built-in, for geotagging and in-app usage, and so is Wi-Fi. The cool thing here, is that the S810c not only has the ability to connect with existing wireless networks, but if you're away from Wi-Fi and do have a smartphone, you can use the Connect to S810c app to hook up a compatible Android or iOS smartphone. From there, it's easy to transfer files to your phone and then, using the phone's cellular data, share images and videos online. All of these apps and features are easily controllable via the 3.7-inch LCD touchscreen display. Not huge by Android phone standards, but pretty good for a digicam. In addition to the digital bells and whistles, the Nikon S810c has some nice camera specs, including a 16MP BSI CMOS image sensor capable of recording Full HD 1080p... Videos which will be shake-free thanks to built-in Lens Shift Vibration Reduction (VR). Finally, this camera features some Creative Effects (most of these will be color filters) that includes an Easy Panorama mode for creating epic widescreen photos in a few seconds. Seriously, remember when the only way to do that was by stitching them together in programs like Photoshop??? Wow. Glad those days are over. The Nikon Coolpix S810c is available in black or white for approx. $349.95 (MSRP). See our best price box at the top right of this page to see the most current online pricing.